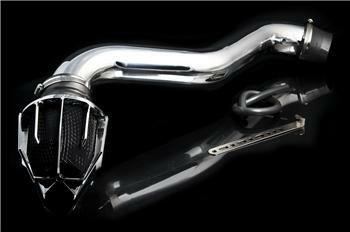 Weapon*R Dragon Intake Systems are one of the mostly highly rated intake systems in the world. Used in many countries in many different forms of racing. Also recently rated “Best Overall Performer”, outperforming Cold Air & Short Ram Intake systems, in the 2003 Tuner Performance Reports, Intake system Battle. Our Intake Systems are CNC Mandrel Bent out of 6061 aluminum, and then Hand Tig Welded to ensure a positive seal and proper fitment. Each one of our intake systems is carefully tuned, by matching the engines displacement, air intake capacity and airspeed to the intake systems tube size and length, maximizing every engines performance output. This Intake is matched with our World Famous Dragon Filter, which provides maximum airflow, with the protection of high quality dense Poly Urethane Foam. Many studies have shown Flow rates of up to 80% more Air and Better Dirt Filtration with Foam Filter than the conventional cotton filter. The Dragon Filter features a Computer CAD Designed and Flow benched Tested Velocity Stack, which greatly increases airflow and air volume into the engine, therefore increasing engine performance. Another one of the Dragon Filters positive features are the capability to be disassembled to be cleaned and then re-assembled after cleanings or to change the color of the foam filtering element.